From the early 1850's until 1861 there were a series of wooden structures on this lot. They were used for a variety of purposes, including a home and a fruit stand. 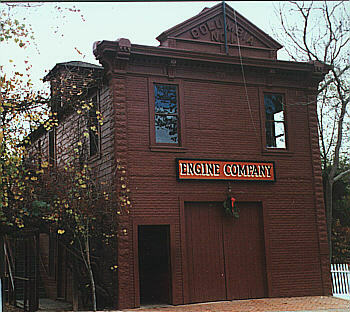 In 1861 the the engine company leased the small one story building that then occupied the lot and used it as a fire house. In 1910 the building was torn down. In 1911 the present structure was built. In 1952 the State purchased the Fire House for one dollar and added the garage to the back of the building in 1957.